April ushers in Capri's high season, when the island's bars, restaurants, and hotels open back up for the season and visitors are welcomed with open arms! Spring is well underway, and the average temperatures are much warmer, though it can still be quite cool in the summer and it often rains. This is the best time of year to hike or walk the island's many trails and visit the archaeological sites. It's still a bit early to swim, but on sunny days you can relax at the beach; the beach clubs on the island reopen for the season mid-month. The weather is still quite variable in April, so it's best to dress in layers with jeans, a shirt with a sweatshirt or jumper over it, and a waterproof jacket. 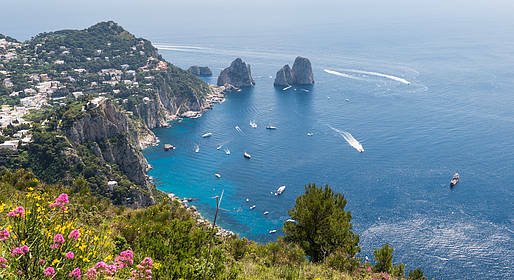 Walks and hikes: April is the perfect month to explore the many trails that crisscross the island of Capri and the Amalfi Coast. Temperatures during the day are mild and the countryside is in full bloom. You should definitely plan to visit Cetrella, a small valley on the slopes of Mount Solaro that is covered in wild flowers during this season. Archaeological sites: The weather is also ideal for visiting the nearby archaeological sites like Pompeii, Herculaneum, and Tiberius' villas. From the 1st of April, ferries begin to run between the towns on the Amalfi Coast and Capri, so it's easier to get around! During Easter week, traditional religious processions are held by hooded fraternities along with reenactments of the Passion of Christ in towns along the Sorrrentine Peninsula. The 25th of April is a national holiday in Itay, so prices may be higher and the island may be more crowded near this date.